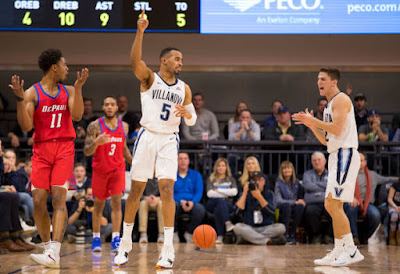 After being a role player for the last four seasons behind players such as, Ryan Arcidiacono, Kris Jenkins, Jalen Brunson and Mikal Bridges, Phil Booth has stepped into the spotlight as a fifth-year senior with a team-high 18.7 points per game. Booth was named to the Big East Honor Roll for the fourth straight week on Jan. 28 after posting 25 and 17 points against Butler and Seton Hall, respectively. Paschall and Booth have formed a powerful one-two punch and are the only key players left from last season’s national championship team. Along with Booth, Paschall made the Big East Honor Roll on Monday after a 17-point outing against Seton Hall, in which the senior became the 67th Wildcat to score 1,000 or more points. After suffering unexpected blowouts out at home to Michigan and Furman to start the season, many fans and media members started to write Villanova off as a lost cause and a transitional team. While the latter may be true, the Wildcats have looked anything but transitional as they are off to a 7-0 start in Big East play, to go along with non-conference wins against Florida State and Temple. A win over DePaul on Wednesday night could put Villanova one step closer to a potential top-ten showdown at Marquette on Feb. 9. Villanova has made the series with DePaul one-sided as it has not lost since Jan. 3, 2008, rattling off 17 wins in a row. The Blue Demons have not come anywhere near making in the NCAA Tournament in the stretch with their last appearance in the 2003-04 season, which happened to be Dave Leitao’s first stint as coach. Big East play has seen DePaul away from Wintrust Arena for the last three games and returns to the friendly confines for the first time in two weeks against Villanova. The first road game of the conference season could serve as a building block for the Blue Demons as they held a 30-16 lead midway through the first half until a furious second half comeback from the Wildcats stalled things in a 73-68 loss at Finneran Pavilion. Max Strus and Eli Cain scored 16 each for DePaul that night and will need similar efforts after struggling on the road trip in order to have a chance at pulling off the upset. Big men Paul Reed and Femi Olujobi will be needed in the paint to execute as they became the go-to-guys in Strus and Cain’s struggles in the last couple of weeks.